CafeSuite consists of the following modules. Shop module allows you to keep record of all sales. Sales are divided into products and services. The module consist of stock inventory, product deliveries, VAT customization, direct and indirect sales, sales deducted from customer account, possibility to cancel recent sales and sales reports. Shop module can be used with POS printer module and barcode reader module. The reservations module makes it possible to reserve certain workstations for your customers when they ask you to. You can view, add, edit, remove and activate reservations on a nice, easy-to-use graph. Reservations can be paid in advance (also partially). CafeSuite can display the time of the closest reservation in a special column. The module also includes waiting queue functionality. System policies module allows you to apply different system policies to the workstations. That includes disabling Control Panel items, MS-DOS applications, registry editor, hiding disk drives, etc. It's also possible protect hard drives from being formatted. This module makes it possible to completely protect your system from malicious customers by limiting access to files and folders on the workstations. Of course, when workstation is in the maintenance mode, all the restrictions are automatically disabled. The killer feature of the disk restrictions module is the ability to assign restrictions to charging rates. For example, you can disable access to the internet for Games charging rate and restrict access to games for the Office rate. Please note that you need to have some computer knowledge to setup disk restrictions properly as they are a very powerful tool. However, once configured it can keep your workstations secured for a long time. POS printer module is used to print receipts and account tickets for your customers on POS printers. The module supports most RS232 POS printers (for example Epson TM-U200 and Star SP-200 ). It makes it possible to print receipts for both computer usage and other sales. Of course, receipts can be easily customized to suit your company needs. This module doesn't include any hardware. Card reader module allows you to log customers in and out by scanning their magnetic cards. It can be used with both prepaid and use-and-pay accounts. Currently CafeSuite supports RS232 serial port readers (for example by MAGTEK). You can use just one reader that is connected to the main computer or get separate reader for every client workstation so that customers log in on their own by simply swiping their card when workstation is locked. Please note that we don't supply scanners nor cards. Smart card reader module allows you to use memory card readers with CafeSuite. As with magnetic cards, your customers can be logged onto workstations just by reading their cards. You can use smart card readers both at the main computer and at the workstations. All PC/SC compatible readers are supported. With this module you can instantly log customers in and out by scanning their barcode cards on the main computer. It can be used with both prepaid and use-and-pay accounts. CafeSuite supports keyboard wedge models or scanners that can emulate keyboard input (so that scanning a barcode is the same as entering proper identifier from keyboard). Of course you can also scan barcodes of products to quickly sell them. Please note that we don't supply scanners nor cards. 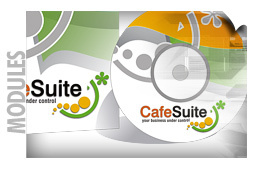 CafeSuite offers built-in print control. The printer can either be networked or connected to any PC. Printouts can be held for manual confirmation, automatically added to session bill or debited from customer account. You can set different pricing for various printers and page formats. Alternatively it is also possible to use independent CyberPrinter software for print control. Also the old printing control module is still available to the customers who purchased it. You can download the installation package on our Downloads page.